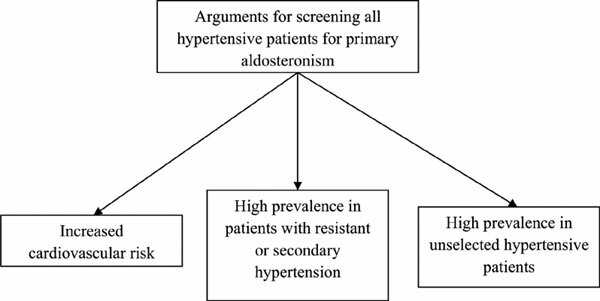 Primary aldosteronism (PA) is not only a leading cause of secondary and resistant hypertension, but is also quite frequent in unselected hypertensive patients. Moreover, PA is associated with increased cardiovascular risk, which is disproportionate to BP levels. In addition, timely diagnosis of PA and prompt initiation of treatment attenuate this increased risk. On the other hand, there are limited data regarding the usefulness of screening for PA in all asymptomatic or normokalemic hypertensive patients. More importantly, until now, no well-organized, large-scale, prospective, randomized controlled trial has proved the effectiveness of screening for PA for improving clinical outcome. Accordingly, until more relevant data are available, screening for PA should be considered in hypertensive patients with spontaneous or diuretic-induced hypokalemia as well as in those with resistant hypertension. However, screening for PA in all hypertensive patients cannot be currently recommended. Primary aldosteronism, secondary hypertension, resistant hypertension, screening, cardiovascular risk.